We've been in the market for a new bed since our little co-sleeper joined us. We currently have a queen size bed, but we've had it for years, and both the mattress (even though it's a Heavenly Bed) and headboard are due for an upgrade. I came across this Nail Button Tufted Wingback Bed at Target.com, and loved the clean lines and linen look. I was originally going to go for the light gray, but after much internal debating, went with the white instead. I'll layer soft plum, deep indigo, and camel leather accents onto the white foundation. I took my sister-in-law's advice and waited for the elusive 40% discount, which dropped today! The king-sized bed ended up being $521.99 on sale. With the REDcard discount, handling, and taxes, the total came to $557.16. Not bad, especially considering a similar look at Restoration Hardware (below) would run me a minimum of $4,249. All in all, I am very happy about this purchase, and hopeful that the bed won't disappoint when it arrives (right before baby's due date... eek!). Now on the hunt for a new mattress... I'm leaning towards this one, which is not the cheapest of mattresses, but the quality seems to be good, and nothing beats the convenience of ordering online. Plus, there's no tax and a 15-year warranty, so amortized over time, the cost comes down to about 29 cents/day. The gift of a good night's sleep (or at least the extent to which we can control that night's sleep) is the best gift we can give to ourselves these days. One of the art studios that I've been following for awhile – Parima Creative Studio – released a special Black Friday deal to subscribers. I just love so many of her pieces, and the fact that the one that is my favorite also shares the same name sealed the deal. I'm turning 3-0 in a couple weeks, and what better way to celebrate a new decade than with a great piece of art that's my namesake. I've felt like my 20s have been about growing into myself and learning to have the courage to like what I like without being unduly influenced by what others like, and this piece captures so much of what my style has grown into. I love the balance of warmth and coolness – camel and black, white and slate blue and that so many of my favorite colors are incorporated – that minty blue-teal that is so coastal California, the soft plum, and the pops of fuchsia and red-orange (think Essie's Hiking Heels). I bought this in the 24 x 24 canvas, which is the just-right size for a statement piece in our small space. It's part of a new color palette that I've been imagining for our place, as I try to put words to my style. Right now, I'm thinking that my dream house is a 'Contemporary Spanish Farmhouse,' but we'll see how that evolves. ;) I'll post pics as the items for our re-style trickle in. Use promo code ARTWKND20 for 20% off through the 28th, if you are interested in snagging a piece of your own. Big Magic was the first book I read this year, and I'm so glad it was. I keep coming back to it when I hit a creativity rut. I have a hard time linking creativity to curiosity because my curiosity tends to be so academic and career-driven. Example: my current obsession is supply chain design & operations, and I'm pursuing a Supply Chain Credential from MIT on the side. I'm naturally disciplined when it comes to work, but not creativity, and I'm excited for my sister-in-law to move into town, so that we can be creative-work partners. 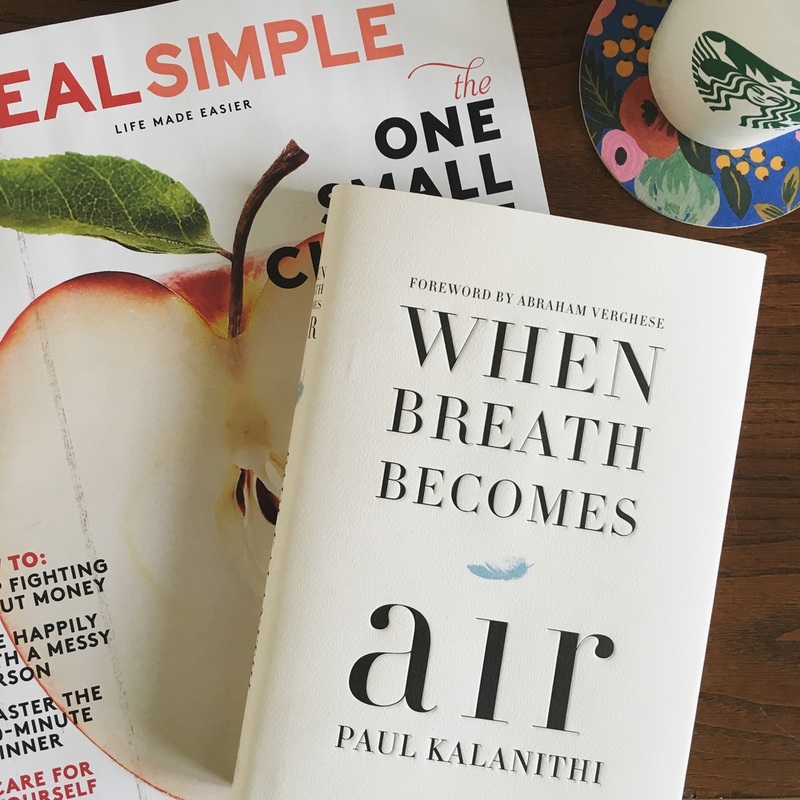 When Breath Becomes Air – I wrote about this book earlier this year, and I still think that it's one of my defining books for this year. The Expatriates. – I was immediately hooked on this book. The story follows the intersection of the lives of three women, with the underlying themes of motherhood and belonging. We spent about a year and a half living as expats in Shanghai, so the backdrop of expat life in Hong Kong resonated strongly. If I had a book club just focused on business, Originals: How Non-Conformists Move the World would be at the top of the list. So, so insightful. I would read passages out loud to Dave, s so we could discuss. I have a feeling this will be a book that I re-read every year. All the Light We Cannot See is a book that I admit I still haven't finished reading. It's the perfect bedside book because the "chapters" are short, and the writing is stunning, so it's like a grown-up lullaby. I've stretched reading this book out over months, but I'm still hooked. It's a gem. Essentialism has been on my to-read list for a while, but I finally pulled the trigger after my friend Ashlee's recommendation (read her related post, here). I'm not quite finished, but I've already been talking about the books examples and principles with Dave and folks at work. The ideas overlap with some of other books I've been reading lately (see my book pairings below), but in a good, reinforcing way. It takes deliberate, sustained effort to do only the things that we alone are meant to do, and the pruning of the 90% of the non-essentials is my work in progress. This season's releases are so good. Liane Moriarty's newest book – Truly, Madly, Guilty – comes out this month, and I can't wait to read it. I devoured her other books. There's always a twist, and they are always funny. I'm also a huge Shauna Niequist fan – I preordered Present Over Perfect months ago, even though it doesn't come out until August 9. Visit her website, and you can get a sample chapter delivered to your inbox. More of my summer reading list, coming soon.